The Artsmiths of Pittsburgh holds its Grand Opening! At last! Though it’s been unofficially open for (exactly!) two months, The Artsmiths of Pittsburgh had its official Grand Opening celebration yesterday. What a treat it was to see the place bustling, with so many people enjoying all the offerings! In the ‘Smiths Shop, people explored the wide range of artworks available from several hundred artists, all from the local region! Some visitors just browsed. Others made purchases: thank you! Lots of them made notes (mental or physical) about items they may return for later on. 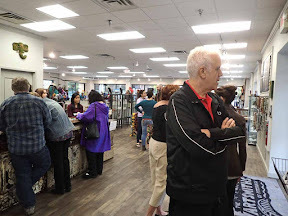 It was great to notice how much interaction there was among various visitors: some conversations were among people who knew each other already, of course, but there were plenty of new acquaintances made as people shared their discoveries. 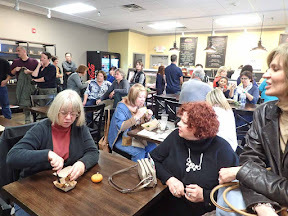 There were plenty of interactions in the Koolkat Cafe too, where folks found more chances to chat and share treats with old friends and new acquaintances. That space was bustling all day as people dined and snacked on both regular menu items and specials of the day, and even had the opportunity to listen to a wonderful series of local musicians. For more photos and videos of this delightful new community resource, feel free to check back to my post from two months ago, the day after Artsmiths’ “soft” opening on August 24. It’s time for another show sponsored by the Cranberry Artists Network, and I’m very thankful to report that I’ve had two pieces accepted! The theme of this show is Let’s be Thankful, and I’m displaying my pieces along with the thankful / gratitude quotations that inspired me as I was making them. 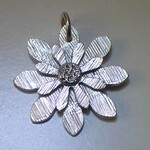 I chose to use silver this time, because I wanted its preciousness to help represent the value of thankfulness. 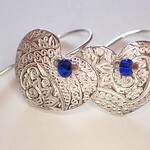 Having done that, however, I deliberately tried to keep them fairly simple, with just a few special embellishments, to keep the prices as manageable as I could. 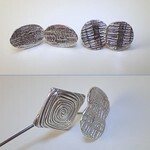 Much as I love making more elaborate pieces, I really do want to offer items that are reasonably affordable. Joyful Gratitude is in a domed triangle shape. 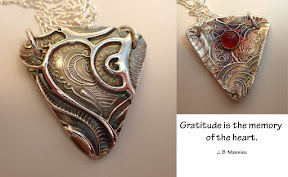 It contains a carnelian on its concave side, said to represent joyfulness, as one form of the depth and range of feelings associated with gratitude. Its convex side exhibits the heart where such gratitude is felt, and held. 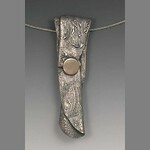 It is offered on a sterling silver chain cut and attached to gratefully “hug” the top of the triangle. 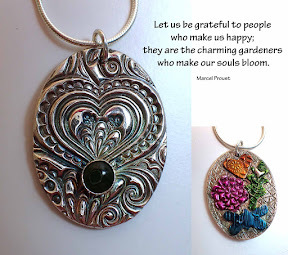 The slightly heftier Grateful Gardeners is a highly textured oval piece. 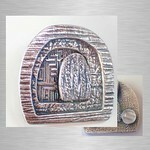 Like much of my work, this piece is reversible. In this case, however, there is one side that feels like the front to me: it exhibits yet another heart-shaped texture accented by a nephrite jade, a stone of the heart signifying friendship, and also considered to be a water-stone and thus appropriate for a garden-theme. The side I think of as the back (though it could well be worn to the front!) 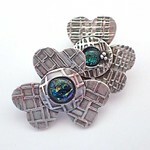 contains a sort of secret garden of textured embellishments: a heart, a leaf, a flower, and a butterfly. The opening reception will be tonight, from 6 to 8 pm. If you can’t get over to that, I hope my local-folks can get over at some point during the show. It runs through November 2 in the Cranberry Township Municipal Center on Rochester Road.